Today, the Nintendo financial results for the Six Months Ended September 30th, 2018 were revealed, and as expected, they’re still pretty good. The company is riding on the success of the Nintendo Switch, though the increase in sales did slow down a fair bit after the Nintendo Switch launch and its explosive sales last year (due to a bigger focus than usual on Q3 this year). Still, the company is still in the black, and it doesn’t look like it’s going to change any time soon. 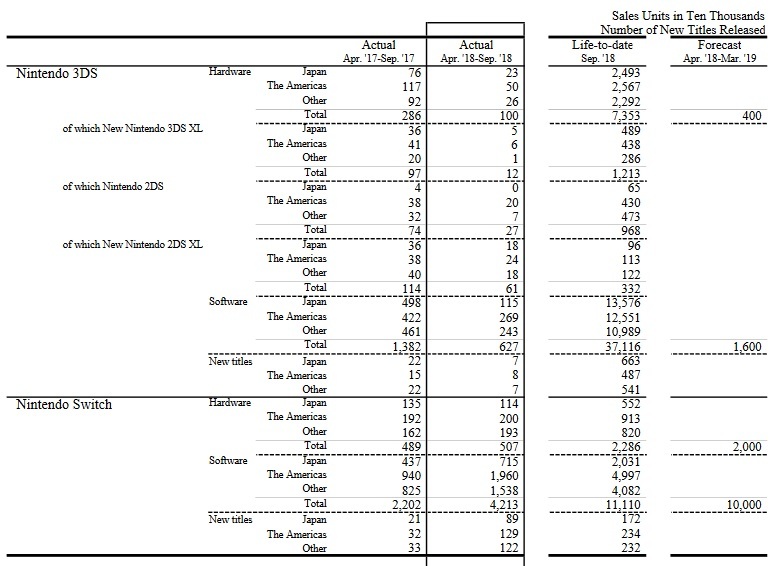 The chart below shows the proportion of Software / Hardware / Other (accesories, amiibo) in sales, but also the geographical breakdown of sales. Sales are up everywhere but in Japan, due to a weaker Summer season (last year had Splatoon 2). Most of sales were made outside Japan (a positive sign, as Europe + North America is a much bigger market than Japan onle). To be precise, sales topped 3 billion Yen outside Japan: that’s roughly 77.8% of total sales. The Nintendo Switch once again account for most of sales this half (~78% of total sales) with the smart devices games making slightly more money (though it’s nowhere near what the dedicated game platforms bring: even the aging Nintendo 3DS alone still made Nintendo more money, though the gap is closing little by little). This particular area account for only 4.8% of total sales, with about 18.766 billion Yen in Q1 + 2. 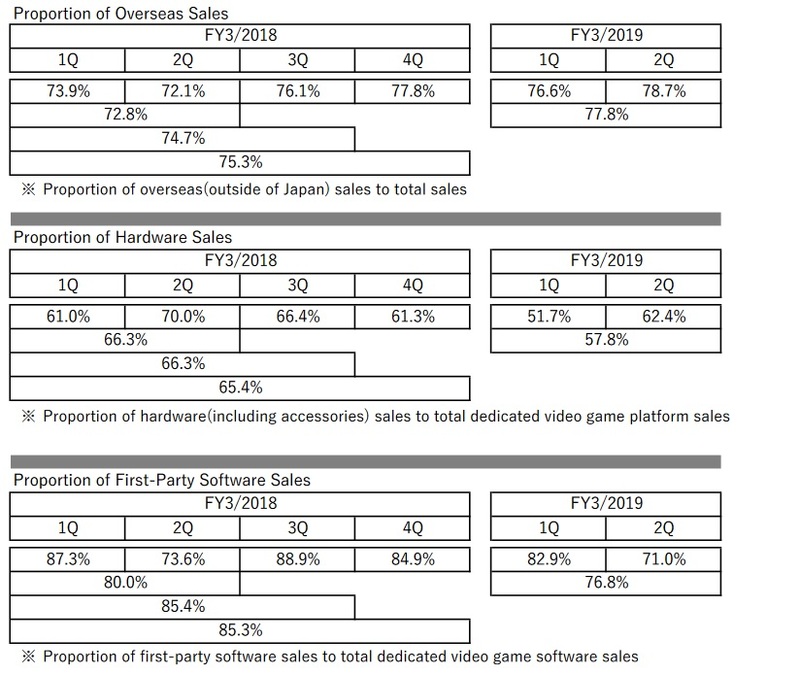 Digital sales = 25.1% of total Software sale during Q1+2 2018-19. * games released in more than one region are counted several times (example: 1 game in 3 regions: counted 3 times). Only include games released at retail. Nintendo explain that during the 6 months ended September 30th, Nintendo Switch Hardware sales grew slightly Year on Year: +3.7%. Software-wise, Donkey Kong: Tropical Freeze was one of the popular releases with 1.67 million units sold since launch, while Mario Tennis Aces sold 2.16 million units since June. Previously released first-party games, along with third-party games, also enjoyed strong sales. According to the company, there’s now 9 million-sellers on Nintendo Switch, including titles from 3rd-party publishers. Year on Year, Software sales increased by 91.3%; there was not as many big hits as last year, but the richer library certainly seems to have helped a lot! On the Nintendo 3DS front, the old age of the dual-screen handheld is clearly showing (already its 8th year on the market). Hardware sales are down by 65.1% Year on Year, and Software sales are down by 54.6% Year on Year. Captain Toad: Treasure Tracker and WarioWare Gold are the two titles mentioned in Nintendo’s report, but no sales data are provided. As for the Nintendo Entertainment System: NES Classic Edition and the Super Nintendo Entertainment System: Super NES Classic Edition, they’re still enjoying strong and steady sales with 3.69 million units sold (that’s counting the 1.26 million units sold for the Nintendo Entertainment System: NES Classic Edition in Q1). 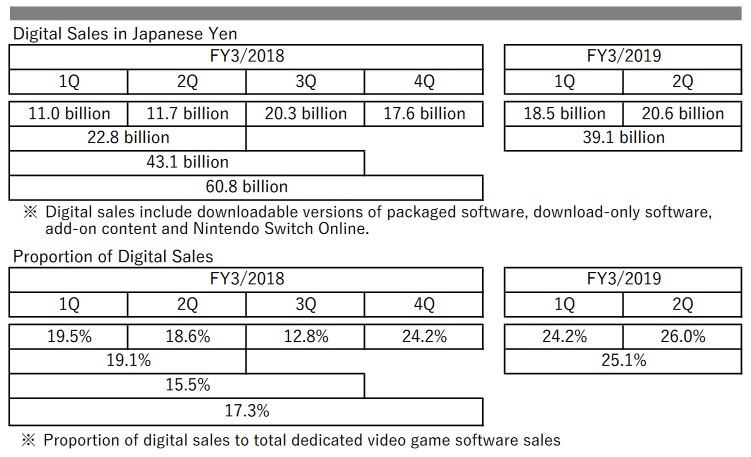 Thanks to strong sales of downloadable versions of retail games and DLC, digital sales are up by 71.7% Year on Year (39.1 billion Yen). On the smart device front, Nintendo only mentions a “good start” for Dragalia Lost, but does not provide any concrete data. Meanwhile, Super Mario Run, Animal Crossing: Pocket Camp and Fire Emblem Heroes are “maintaining steady popularity”. As whole, the business grew slightly, with +4.7% Year on Year. Nintendo decided not to make any changes to its financial forecast for the current Fiscal Year. Their strategy for the platform remains the same: accelerate the momentum by releasing compelling new games, alongside those already available. On Nintendo 3DS, same old strategy: leverage the rich library and Hardware install base to further increase sales of evergreen titles.